One of my favourite fifties dresses (from a great grandma- who else? ), I felt like a massive walking flower in this ensemble! 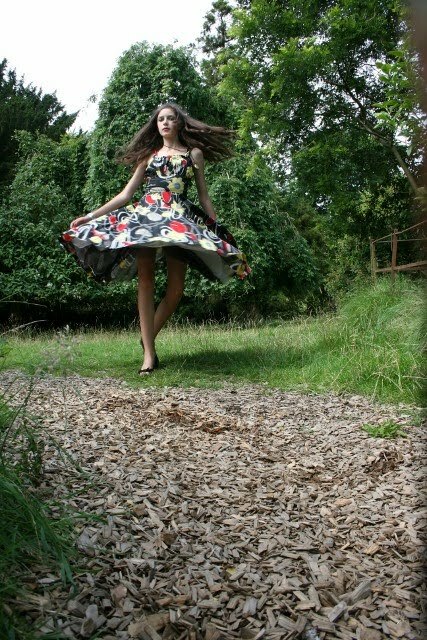 Taken in a local arboretum by the wonderful flo. Lots of pieces of clothing stolen from my mum! The beautiful green dress was one she bought from Beyond Retro, and the jacket was a vintage one of hers. Oh, and the boots were hers too! Sadly now too small for me. Taken in a field on a hill above my house. My paternal grandmother's much lusted after Balenciaga dress! As I said before, it still amazes me when you look at the detail- it's obvious how much time and effort was put into making the garment. Taken in my grandma's flat, complete with original vintage decor! The second part of a homage to Ophelia in a raw silk ball gown. Looking back at the summery photos in particular makes me wish for the days when I can tread outside without 5 layers on. 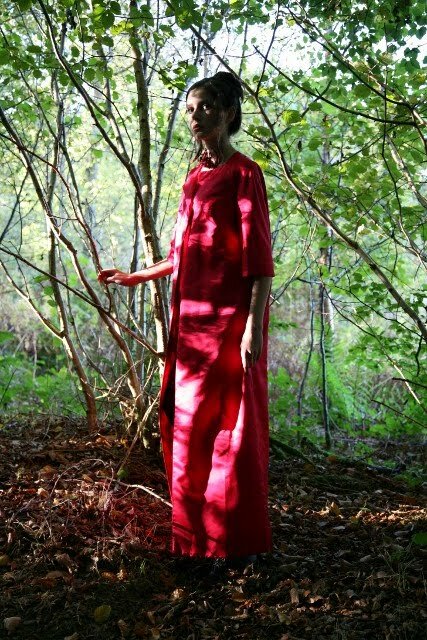 A beautiful red satin evening coat given to me by my paternal grandma shot among the trees of a nearby place. I love the vibrant colour of the coat, that very opulent shade of red. 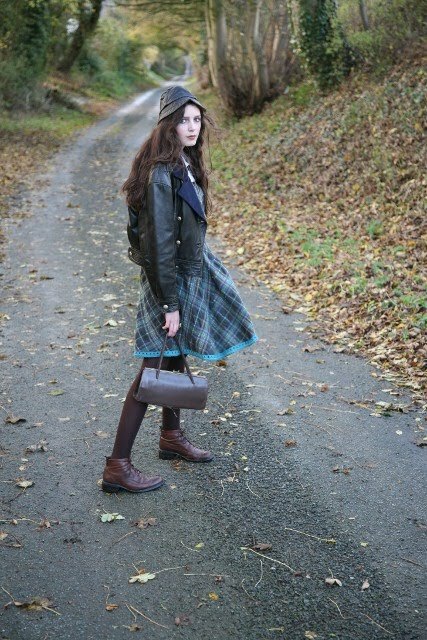 A wool tartan skirt rescued from being thrown out, used as a dress. The leather jacket was an Escada one found in a charity shop. The boots- my mum's. Taken on the road behind our house, resplendant with autumn leaves. I know I still posted this quite recently, but is definitely one of my favourite shoots ever! I adore this striped taffeta skirt, and added my mum's little black cardigan. Thrifted Italian made shoes. This was included on one of my very early posts. Last easter I did a shoot for a local vintage shop called Berties. This exquisite fifties house coat was by far one of my favourite pieces- I have now been searching in vain for a similiar one since. The shoes are also vintage. Happy new year everyone! I hope you've enjoyed 2009, and are looking forward to 2010. The past year has certainly been pretty eventful for me. I started my blog back in June, what a long time ago that feels like now! I'd just like to say a massive thank you to everyone who has read, commented and followed my blog in the past six months- I really appreciate it! I thought I'd start off the new year by choosing my ten favourite photos from 2009 to show you all here. (Ten because it is 2010, although I have to admit it would have been much easier if it was 2015 or something!) They range from the very beginning right up until december. Looking through the photos made me think about how my style has evolved, probably partly due to having this blog! Back to school for me on tuesday, meaning I'll be a lot busier (especially having maths and science exams coming up) but I'm going to try my hardest to keep up with my blog. One last thanks before I go. 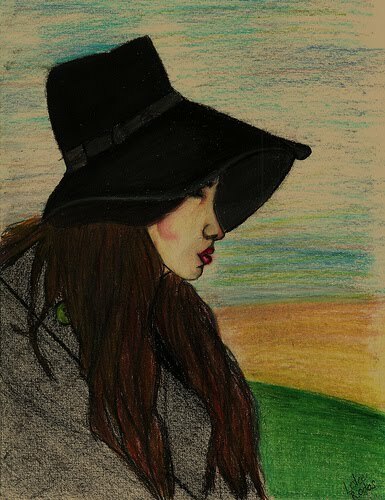 The lovely Leslee of http://inkmyfashion.blogspot.com/ did this beautiful portrait of me. I love it, especially the distinctive style and the use of colour. It's so nice that she chose me to draw. So a very big thank you there! Enjoy this year, I for one am looking forward to what will happen.. I'm grateful for your comments and support and insight, too, and am such a fan of your blog! youre sense of style is second to none. A new year and a new beginning! What a wonderful way to start the year! Out of all the photographs above, I find that the one where you are in a box is the cutest and most creative. Although, the one I consider to be my favorite when it comes to overall favorite would be the one where you are in a dress in the stream. I really cannot wait to see what more chic and creative pictures you take this new year! i started following your blog recently but it was wonderful to see all your amazing shoots you've done in the past 6 months. I personally adore the 2nd homage to ophelia. i wouldn't have the guts to sit in a river with such a dress, buts interesting how it seeps in. That pink coat looks amazing. Roz, I completely love reading your blog and the amount of thought that you put into every post. Each of them are individual and oh so inspiring. This post is particularly clever and I recognise the quotation from University Challenge and I have also seen a film called Starter For Ten which I very much enjoyed -- have you seen it or heard of it? Looking through the compilation of ten photos (not nearly enough, I agree! ), I still haven't been able to deem one of them as my favourite; they all are! They're all so filled with a timeless beauty, so creative and infinitesimally inspirational. Each outfit is picked out tastefully and every single one of the setting compliments the outfits brilliantly. I am such a fan and have thoroughly enjoyed reading your blog posts throughout the time I have had a blog (yours was one of the first I ever followed) and I will continue to look forward to your future posts in 2010. A very Happy New Year to you and I wish you all the best for 2010. Oh!!! Just gorgeous stuff here!! I especially LOVE that last shot!! 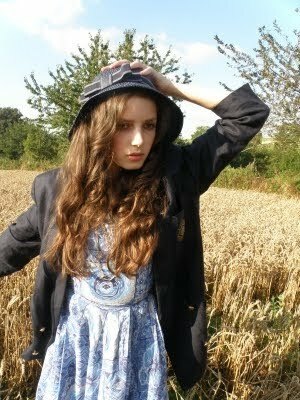 You have some totally amazing vintage clothing! Your a very lucky girl! Im on the hunt for some nice vintage dresses this year! I love all of yours! what a beautiful post! happy new year! happy new year, dear Roz! and i appreciate your intelligent and insightful comments on Style Odyssey over the past few months. one thing i enjoys so much about blogging is the wonderful exchange between fellow bloggers. i'm grateful for yours. i enjoyed this post- some of these i had not yet seen. i've said this before but it's worth another mention: you are wise and stylish beyond your years, proving that good taste is ageless. Just amazingly beautiful photos, dresses, you. Happy New Year and all the best in 2010!!!! Found your blog after visiting Leslee blog and drawing! You are adorable and great outfits and dress! wow I love your dresses and shoes! darling I just have to say that you're simply stunning. I loved all the outfits & the places you took the pictures! Especially the boots & the raw silk dress though all of your clothes are very beautiful! All your posts are beautifully done and each outfit is gorgeous! I've just started following your blog recently but I look forward to looking at your future posts!! p.s. Hope back to school is going well. Don't worry about reading or replying to my long email - it can wait & isn't important. I love all of these photos....how neat that you get so many gorgeous pieces from your mother and grandmother! Amazing photos AMAZING outfits... I especially love the brown boots and green dress and the silk gown- what creative styles. Cool blog! !